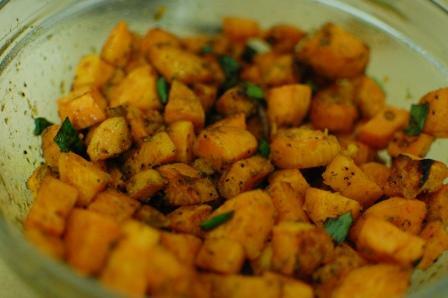 Sweet potatoes are in season right now and always remind us of the holidays. Whether it is a delicious sweet potato pie with a dollop of lightly sweetened freshly whipped cream or the mashed sweet potato casserole with marshmallows on top, everyone has sweet potatoes as an offering at the holiday table. Peel and cube the sweet potatoes and toss them with oil. Sprinkle them with coarse salt and roast in the oven at 400-450F for about 15-20 minutes. (This all depends on how big your cubes are and how hot your oven cooks, so keep an eye on them.) You want soft cubes. While they are cooking, make your dressing. Combine about 5 Tbs. or so of oil, vinegar, dill, pepper, pinch of salt, and garlic powder. Taste and see what it needs. Remember, your potatoes are pre-salted so the dressing may not need much salt. While the potatoes are still warm, toss them with the dressing and the chopped scallions. I'm going to have to make this when my mom comes down for New Year's weekend. We share a sweet potato addiction, and this would be a totally new way to indulge! Oh please do make this for your Mom and then let me know if y'all liked them. Engineer does not care for sweet potatoes but actually labled this salad as "good" and not his usual "edible" when it comes to the tubers. 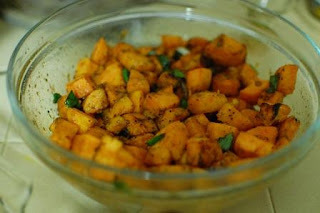 We have so many great sweet potatoes in this part of Texas and we just love our sweet potatoes. Your salad looks awesome and I can't wait to try it. Hope you are having a great week and thanks so much for sharing with Full Plate Thursday. This recipe is awesome! We all loved it!! Thanks Julie! Yea! I'm so glad y'all liked it Ms. Joanie!